Michael Elmgreen and Ingar Dragset’s “Powerless Structures, Fig 101” atop the Fourth Plinth in Trafalgar Square. Photo by Allan Harris. Trafalgar Square is one of London’s iconic and most exciting open spaces. 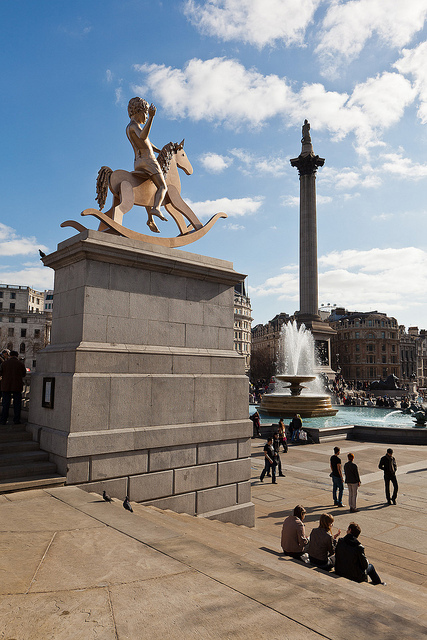 Marking the centre of the square, Nelson’s Column soars high above its base surrounded by four giant bronze lions. Here you’ll often find kids and travellers from around the world scrambling up for a photo atop or nestled between the paws of one of the regal lions. The two large fountains are just as popular for photos with the beautiful classical style facade and dome of the National Gallery, the lovely spire of St. Martin-in-the-Fields by James Gibbs or the tower of Big Ben at Westminster in the background. With so much to see and a buzzing atmosphere, visitors might just miss a touch of contemporary art that now graces Trafalgar Square. In each of the four corners of the square there are stone plinths put in place in the mid 19th century as the bases for large bronze statues. The two plinths on the southern side feature statues of Henry Havelock and Charles James Napier, while the northeastern plinth supports a large equestrian statue of George IV. The fourth plinth was built in 1841 and was created the same size as the other northern plinth as it was intended as the base for an equestrian statue of King William IV. So what happened? Since consensus and funds never arrived at the same time, the statue for the fourth plinth never arrived. Londoners pondered the empty plinth while countless tourists strolled by and likely didn’t even noticed the empty space. “Nelson’s Ship in Bottle” on the Fourth Plinth near the National Gallery in Trafalgar Square. 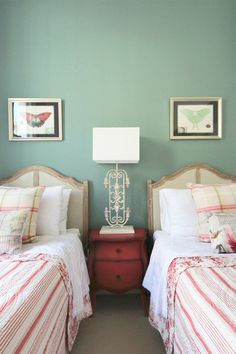 Photo by Paul Hudson. Public interest in the poor empty fourth plinth picked up again in 1998 as Londoners and art critics pushed for something to happen. 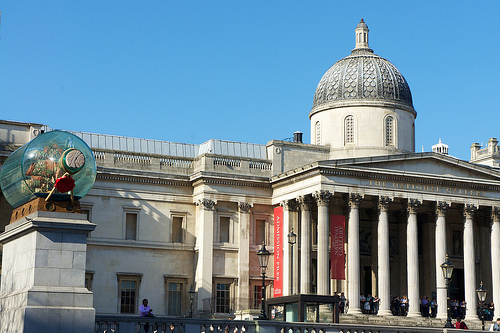 The Royal Society of Arts (RSA) launched the Fourth Plinth Project in the same year, and installed temporary works of art by Mark Wallinger, Bill Woodrow and Rachel Whiteread. Since then the Fourth Plinth has been the setting for changing installations of work by important contemporary artists from around the world. With it’s new function as a spot for highlighting contemporary art installations, the fourth plinth has finally become part of the much-photographed landscape of Trafalgar Square. 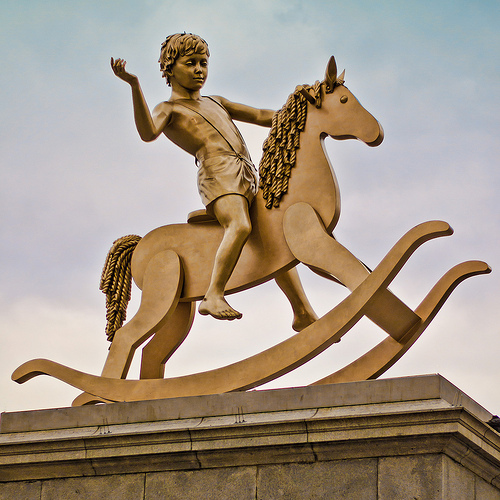 A close up of Elmgreen and Dragset’s statue in Trafalgar Square depicting a boy on a rocking horse. Photo by Garry Knight. If you’d like to stay near the excitement and fun of Trafalgar Square, we invite you to view The Eden and The Savoy, two of our London vacation rentals located on a peaceful street nearby. We were amazed when we found this charming and quiet historic street where Benjamin Franklin once lived and famous authors such as Herman Melville lived and worked just around around the corner from exciting Trafalgar Square. 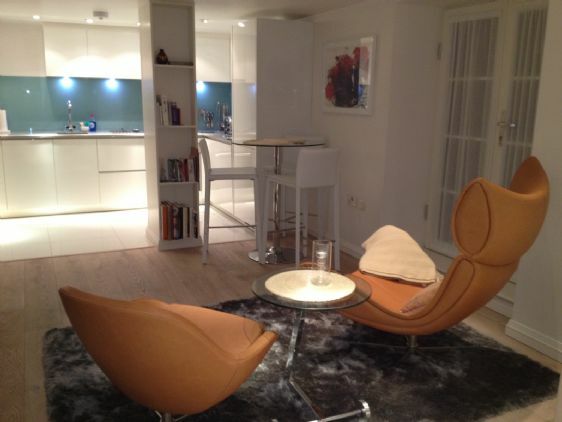 The Eden is a charming and fully remodelled studio rental decorated with a contemporary London design. 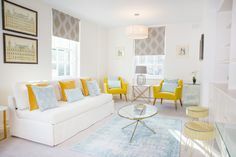 Nearby our lovely two bedroom vacation rental The Savoy features two bedrooms, two bathrooms and a spacious and elegantly decorated living room perfect for relaxing with friends and family after a day of sightseeing in London. 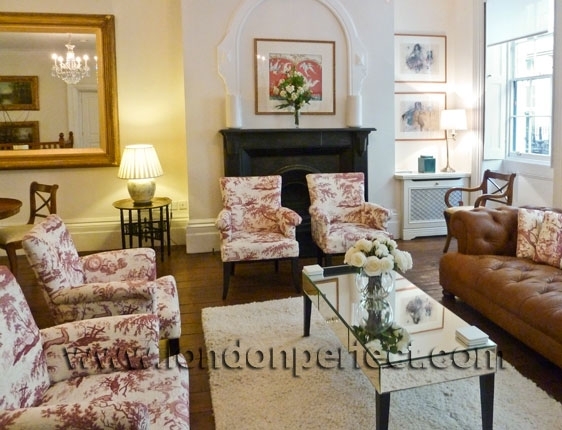 Both of these London vacation rentals are offer a peaceful home away from home just a short walk from the excitement of Trafalgar Square, London’s West End, the Theatre District, Covent Garden, the great shopping and lively night scenes in Soho and Mayfair and Big Ben in Westminster. Next time you pass through Trafalgar Square, be sure to stop by and see what’s on the Fourth Plinth! 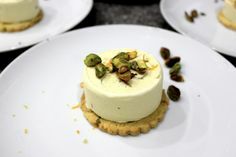 Posted on Tuesday, June 19th, 2012 at 11:21 am in See & Do. You can follow any responses to this entry through the RSS 2.0 feed. You can leave a response, or trackback from your own site.